U.S. Army Is Discharging Immigrant Recruits Who Were Promised Citizenship Dozens of immigrant recruits who joined the military through a special Defense Department program, promising a path to citizenship, have been abruptly discharged with little or no explanation. This photo provided to the AP by Panshu Zhao shows Zhao in uniform on Feb. 11, at a U.S. Army Reserve installation in Houston. 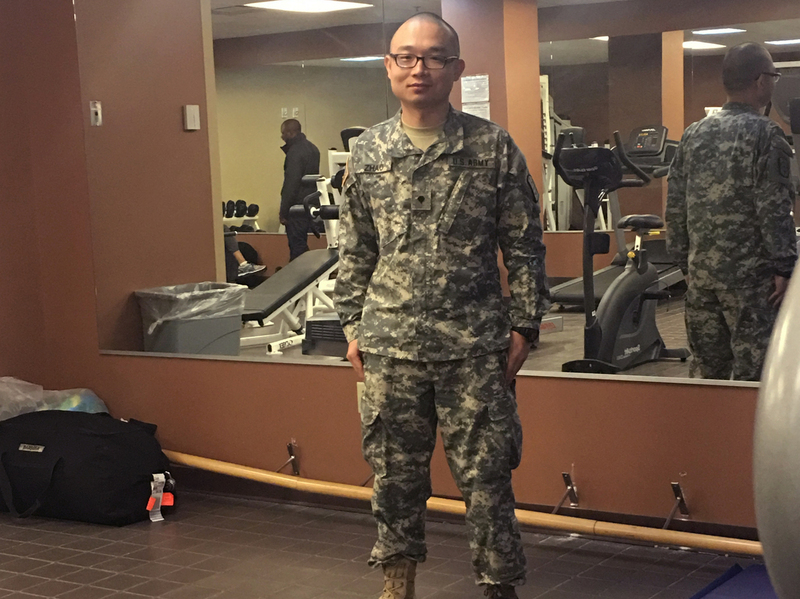 Zhao is one of dozens of immigrant military recruits and reservists who have been waiting for years to deploy but were recently discharged with little explanation. The latter includes regular attendance at a Christian church and a deep respect for the military. So deep, in fact, that in 2016 he enlisted and has been serving in the Army Reserve while awaiting orders for full-time training. But Zhao recently found himself among dozens of immigrant recruits who joined the military through a special Defense Department program promising an expedited path to citizenship, but then were abruptly discharged with little or no explanation. According to The Associated Press, about 40 enlistees — reservists and active duty recruits, all in the U.S. legally — had been waiting for years to be cleared for duty before being told in recent weeks that they are not eligible to serve in the U.S. military. And for many, the rejection has thrown their immigration status into limbo. "This is a whole disaster," Zhao told NPR. The devastating news was delivered by his recruiter, who told him, Zhao said, that for unspecified reasons, he had failed a background check. He said the recruiter "told me I can't be a soldier anymore without telling me specifically why and even not giving me any chance to appeal." The Pentagon has denied any changes in policy. In a statement Friday, Cynthia O. Smith, a Department of the Army spokeswoman, said all recruits are required "to undergo a suitability review as part of the military accessions process" and "one aspect of that review is a security screening." A non-U.S. citizen recruit who receives "an unfavorable security screening is deemed unsuitable for military service and is administratively discharged," the statement said. Among the qualities that might make a potential enlistee under the program unsuitable are a criminal record, dishonesty or questions about character. Smith said the length of time for reviews varies and is dependent on each recruit's "individualized suitability review" and the person's "unique background." The immigrants who were recently discharged had all signed up as part of the Military Accessions Vital to the National Interest, or MAVNI, program. It was established in 2009 to create an opportunity for the military to enlist people with specialized knowledge, including highly sought-after language and medical skills. Those enrolling had to reside in the U.S. legally, such as under student visas, or seek asylum but could not be green card holders. Enlisting gave them a fast-track path to citizenship, sometimes even before beginning basic training. Over the past nine years, about 10,400 foreign-born service members have joined the military through the program. But as more and more layers of security checks have been added, hundreds of enlistees have been stuck in a state of purgatory. The MAVNI program has had a troubled history almost from the start. It was suspended shortly after it got off the ground in 2009, following a shooting rampage at Fort Hood, Texas. Before authorities discovered that U.S.-born Army Maj. Nidal Malik Hasan was behind the massacre, officials feared the risk of a foreign-born insider threat within the ranks. That eventually led to more stringent security checks when the program was reinstated in 2012. Lawmakers later objected when it was expanded to include recipients of the Deferred Action for Childhood Arrivals (DACA) program in 2014. The MAVNI program officially ended in 2016, on the heels of a "classified assessment that said it was vulnerable to unacceptable levels of risks, like terrorism and espionage," Maj. Carla Gleason, a spokeswoman for the Pentagon, told NPR in an interview. But, due to a processing logjam, officials requested and were granted a yearlong extension during which new enlistees could still apply. That expired in September 2017. Since then, the program has been shuttered while officials continue to work toward completing all remaining security clearance evaluations. In October 2017, the Pentagon changed the naturalization policy for MAVNI enlisted troops. Before then, enlistees could apply for citizenship a couple of days before basic training and before a complete security screening. Now, personnel are required to serve honorably for 180 days and the full screening must be approved. Gleason said that "as of April 2018, roughly 1,100 people who had signed contracts but had not gone off to basic training" were in the delayed entry pipeline. There is no established deadline for processing security checks, according to Gleason and she is unaware of any plans to reinstate the MAVNI program at this time. But she added, "The skills that made this program valuable are skills that remain necessary to the military. We are a diverse force that needs cultural and language diversity." The discharge of the immigrant recruits and reservists comes at a time when the Army needs more soldiers. And the booming economy is making it hard to find those willing to sign up. This year the Army said it needs 76,000 recruits to fill its ranks. That's 16,000 more than last year. Adding to the challenge, some 70 percent of young people don't qualify for military service because of criminal convictions or failure to meet the education or physical requirements. So the Army is being forced to give waivers to recruits, for such things as minor drug charges or physical problems, to boost enlistment. In comparison, a 2017 RAND study found that MAVNI recruits "have a number of characteristics associated with better performance, including age." The study also said they have higher levels of education and higher Armed Forces Qualification Test scores. The Military Times estimates that the "remaining 1,000 or so participants" who are still waiting to be cleared for duty will likely be released from their contracts. Meanwhile, for men and women with expiring visas, their chances of becoming naturalized citizens are shrinking, retired Army Reserve Lt. Col. Margaret Stock told NPR. "They are timing out of the program before they even get a chance to serve because they only have three years" during which they can go without reporting for duty, Stock said. Stock, who has been contacted by several dejected and confused MAVNI recruits who were "administratively discharged" over the last couple of months, helped create the program. She contends the spate of rejection notices — either by phone, email, text or letter — by the DOD is the department's solution to an onerous vetting process and the program as a whole. "They ordered a whole pile of new background checks and they have no capability or resources to do them, so the solution is, 'Let's just get rid of these people because it's too much trouble to process them,' " Stock said. Many of the people reaching out to Stock for help say they have not been told why they have been rejected, and they received only a terse explanation of "national security reasons" from officials. And they have no means of appealing the process, so they are asking Stock for legal advice. She is now an immigration lawyer. She argues the military is violating its own regulations, which state that when a person is discharged based on the security investigation, they have to be notified and given an opportunity to contest the findings. Last week, Lucas Calixto, a Brazilian national, filed a lawsuit against the Army alleging that he was eliminated from MAVNI for "personnel security reasons." He is demanding a chance to defend himself. NPR interviewed a reservist who filed a Freedom of Information Act request and received records containing the reason for his discharge. He asked not to be identified by name but provided the documents to NPR. In them, the Army lists seven categories for discharging someone including financial, loyalty, criminal and foreign ties. In this man's case, officials determined his foreign ties made him ineligible for the MAVNI program. They cite the fact that both of his parents and his fiancee still live in Pakistan. In a separate section, the man's Counterintelligence Reviewer notes that the recruit "has wanted to come to America since he was five." Also, that his cellphone case is an American flag and that he has a U.S. Army bumper sticker on his car. He "has such a deep and longstanding loyalty to the U.S. that HE can be expected to resolve any conflict of interest in favor of the U.S. This mitigates [his foreign ties risk]," the reviewer wrote. Despite the vote of approval, the Pakistani man was still discharged. "These are the reasons on the basis of which I've been denied, or, you know, I've been declared unfavorable for military," he told NPR. Recalling the moment he first learned of the discharge after waiting more than two years for active duty deployment, he said, "There were so many tears in my eyes that my hands couldn't move fast enough to wipe them out." Stock, who has reviewed the document, said the explanation doesn't make any sense. "The paperwork just said foreign ties. But they're ordinary, normal ties that any immigrant would have," she said, adding that "many members of the military who are married to foreigners [have] children born in foreign countries, have parents who are foreigners, brothers and sisters who are foreigners." "It's very common in a global military like the United States military that people will have foreign ties," Stock added. That is little comfort to the man from Pakistan and Zhao, who fear the possibility of being deported as a result of their discharge. Both took an oath of allegiance upon enlisting, and they fear that will make them targets of their respective governments back home. In Zhao's case, he formed an organization called Asian-American Soldiers for America that delivered letters to President Trump last year and met with several senators and congressmen on a visit to Washington, D.C.
"I'm pretty sure the Chinese government knows what I did, and that they know my name," he said, referring to the oath of allegiance. "I don't know what will happen if I go back." NPR's Tom Bowman, Monika Evstatieva and Gail Austin contributed to this story.